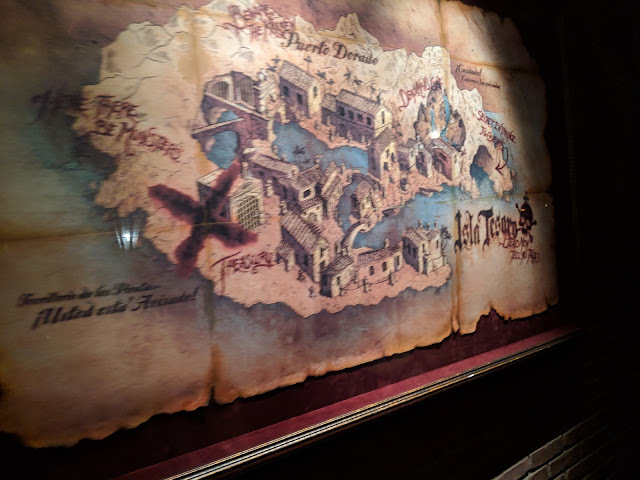 I've now been on three different Pirates of the Caribbean rides in three different parks. The first one I ever rode was down in Walt Disney World. And it is great. Has just one drop and what I thought was a really nice show. But then, I rode the one in Disneyland. Woah. Totally different and ummm...better? Like, first there's the pre-pre show. The whole seeing the boats come around the Blue Bayou restaurant into the loading area. Then the whole bayou scene with the guy playing the banjo and the fireflies buzzing around. Then the drops. There's more than one! That was nuts to me. 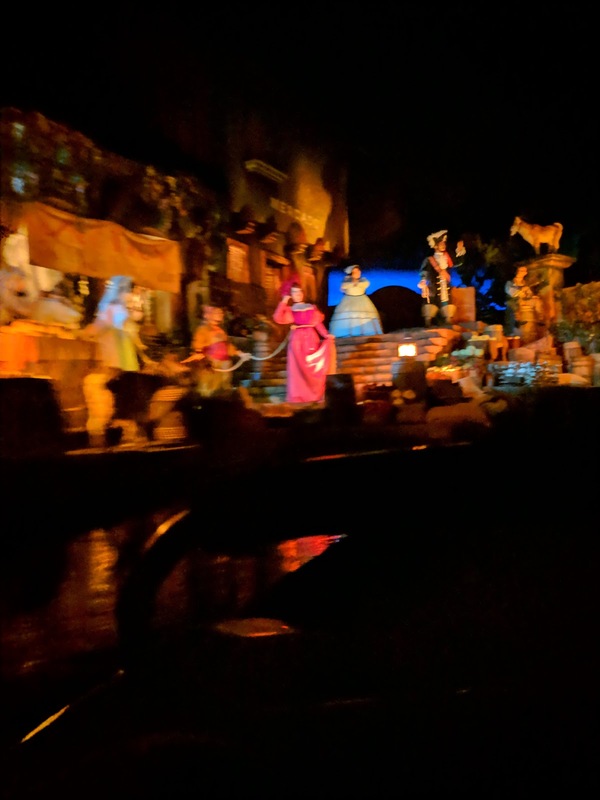 And now I have these (admittedly) blurry photos of the Pirates of the Carribbean at Tokyo Disneyland. The reason they are all blurry is that there are tons of signs advising one to NOT take photos on the rides and so I wasn't sure what to do. I was worried about the brightness being seen from my phone screen on the ride, so I pressed the phone against my body, tried to put my finger on the button and just kind of hoped for the best. I was sitting in the front seat and the Tokyo version has just one drop. But it is in a different spot of the ride. 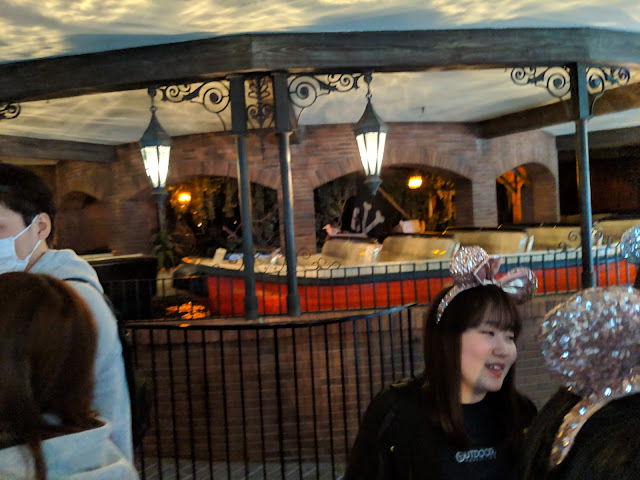 Unlike the Orlando version, it isn't right before the big room with the large ship scene. It is earlier in the ride. The photos here show off a few things: first, the top photo shows the boats coming into the loading area. This is just like Anaheim and the original Disneyland setup. Then, right below is a photo of a map that is painted on the wall right before you load into the boats that calls out Isla Tesoro and has the whole "Dead Men Tell No Tales" line on it. But, here's the key part: Tokyo Disneyland still has their redhead. In her original form. Being traffic'd as it were. They even use the english version and have the whole: "Shift yer cargo, dearie, show 'em your larboard side" line. Those of you paying attention know that down in Orlando, the Redhead has changed roles and is now a pirate. Instead of being part of the auction, she's telling the drunk pirates to pipe down while they try to move some chickens. Wonder how long they'll keep this version up in Tokyo? If you 'wants the redhead', get yourself to the Tokyo park to see it before they change their minds there.